If there's one good thing to come out of the emerging market rout, it's cheaper valuations. The MSCI Emerging Markets Index's 11 percent retreat in local currency terms so far this month has pushed its 12-month forward price-to-earnings (P/E) ratio to 9.4 – a touch below its 5-year average of 10, according to Capital Economics. 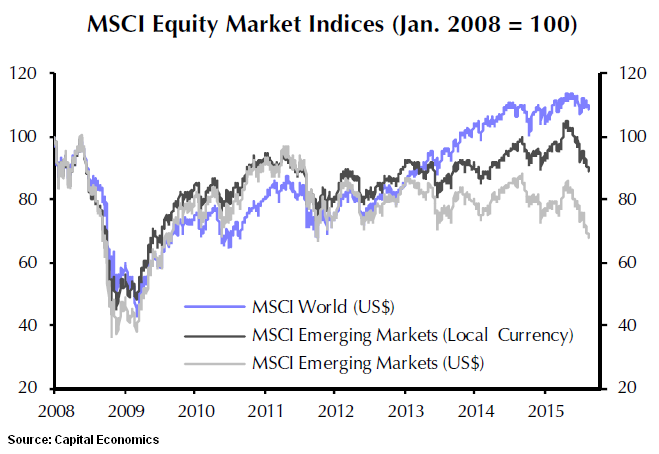 The valuation gap between MSCI World Index - which tracks 23 developed markets - and MSCI Emerging Markets is now at its widest point since before the global financial crisis. The MSCI World Index is trading at a forward P/E ratio of 13.9. A higher P/E ratio implies that stocks are relatively pricey compared with earnings. "Emerging market equity valuations are no longer stretched either in an absolute or relative sense following the summer sell-off," said John Higgins, chief markets economist at Capital Economics. "Once the recent volatility in global markets settles down, we think that these valuations could rise, leading to some outperformance of EM equities in the months ahead," he said. So, which is the cheapest market then? Of all the major emerging equity markets surveyed by the research house, Russia is currently the cheapest on an absolute basis. The forward P/E ratio for the MSCI Russia Index stands at 4.9 – compared with its 5-year average of 5.2. Capital Economics' findings are based on an analysis of 20 individual MSCI EM country indexes. The MSCI Egypt Index follows in second, with a forward P/E ratio of 7.3; however, it remains above its 4.3 long-term average. The MSCI China Index is not far off, with a forward P/E ratio of 7.8, 13 percent below its historical average of 9. The MSCI China index has a lower P/E ratio than the Shanghai Composite, the most widely tracked stock index in the mailand. That is because the MSCI index largely tracks Chinese companies listed in Hong Kong, or H-shares, which typically trade at a discount to A-shares – Chinese companies listed in the mainland. The markets that have fallen furthest below their long-term averages are the Peru, Colombia and Taiwan. The MSCI Peru, MSCI Colombia and MSCI Taiwan indexes are trading at a forward P/E ratio of 9.4, 11.2 and 9.9 or 32 percent, 25 percent and 22 percent below their 5-year mean, respectively. Mikio Kumada, executive director and global strategist at LGT Capital Partners agrees emerging market equity valuations seem far more reasonable following the recent selloff. "Valuations have corrected a lot in EMs, China H-shares in particular look attractive now that they're even cheaper," he said. However, Kumada says he wouldn't go as far as predicting outperformance of emerging market equities relative to their developed market counterparts based on the dip in stock prices.